The John Hughes Group is the largest single location new and pre-owned motor vehicle retailing Company in Australia. With eight new car brands (Mitsubishi, Hyundai, Volkswagen, Ford, Kia, Jeep, MG and LDV), approximately 2,000 pre-owned vehicles in stock at all times, plus departments for servicing, parts, finance and insurance among others the Company lives up to the tag line “Your car buying destination.” The Group employs over 500 staff and sells in excess of 15,000 vehicles every year. What we know today as the John Hughes Group began in 1969 when John Hughes purchased a vacant service station site in Victoria Park to start his own business, Paramotors, located in the now familiar location just over the causeway on Shepperton Road in Victoria Park. Within a few years the Company became the leading independent used car organisation in Western Australia. In May 1980 John took over the inner city Mitsubishi franchise in Victoria Park from the Skipper Bailey Motor Company giving him his first new car franchise. It traded as Skipper Mitsubishi until 2005 when John changed the name to John Hughes Mitsubishi and has been ranked WA’s number one Mitsubishi dealership for over 3 decades. John Hughes was a founding shareholder and director of Bond Motor Sales, the original importer of Hyundai motor vehicles in Australia. He was responsible for setting up the importing infrastructure and the appointment of dealers in the early stages of development of the Hyundai Motor Corporation in Australia. 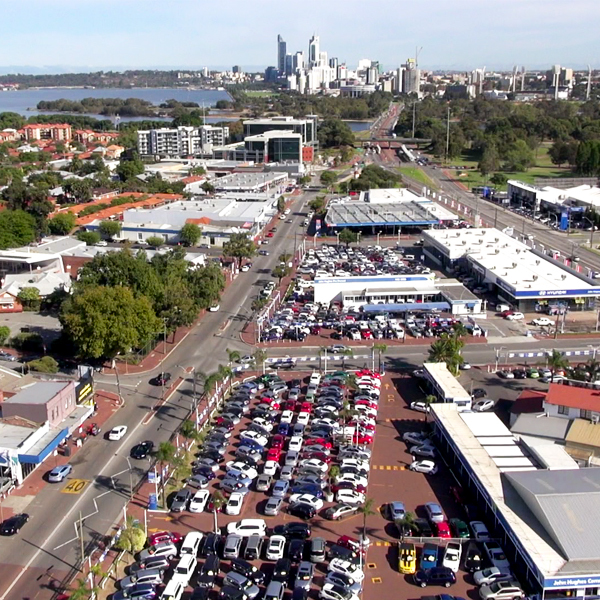 Hyundai has proven to be an impressive success story and John Hughes Hyundai has consistently been the top selling Hyundai Dealership in Australia, and for a number of years was the largest worldwide – an impressive achievement given the small population size of Perth. From the late 1990’s onwards, the John Hughes Group grew into the automotive empire we know today. In 1998 John Hughes Volkswagen opened its doors, stocking the Volkswagen passenger vehicle range. In 2006 the Group purchased the Park Ford dealership in Bentley and later relocated it to the main John Hughes Group site on Shepperton Road in Victoria Park. Hyundai’s sister company Kia was next to open, following a very similar path in the market place to Hyundai, John Hughes Kia is now ranked WA’s top selling Kia dealership. The final piece of the puzzle is John Hughes Jeep, opening its doors in 2012 and has always been ranked Perth’s top Jeep dealer ever since. The Group has diversified into many peripheral areas in the automotive industry. Aside from sales, the Service and Parts Department is the largest of these divisions. The Group has two of the largest service centres in Western Australia, one in East Victoria Park with 60 work bays which caters to the Groups new car franchises (Mitsubishi, Hyundai, Volkswagen, Ford, Kia and Jeep) and the other in Welshpool with 50 work bays catering to all makes and models. Both service centres are staffed with factory trained technicians who have access to and are trained in the use of the latest state of the art technology. The Group operates a fleet of mobile service vans capable of carrying out most routine maintenance at the customer’s home, workplace or almost any other location. The Group’s parts department stocks an extensive range of automotive parts, accessories and related products. Specialising in the supply of genuine parts for the eight new car franchises Mitsubishi, Hyundai, Volkswagen, Ford, Kia, Jeep, MG and LDV. The Group supplies a number of workshops across the greater Perth area as well as selling parts over the counter. The group also sells an excellent range of car tyres and batteries suitable to most makes and models and offers services such as window tinting, panel and paint, paint and interior protection and upholstery repair and restoration. Further reinforcing the Groups tagline “Your car buying destination” the John Hughes Group operates their own finance company giving the customer the ability to purchase and finance their car at the one location and with the same business. The Group also operates Sovereign Credit, a finance company which provides finance to those ineligible for finance through the mainstream lenders. The Group also underwrites its own extended vehicle warranties enabling the customer to take care of all their vehicle purchasing needs with the one company. The success of the John Hughes Group can be attributed to a number of factors; however, the main focus of the business has always been to serve the customer to the highest possible level. The Company Philosophy reads “We are a friendly and efficient company, trading with integrity and determined to give our customers the very best of service.” John Hughes has long been recognised for his totally committed approach to “hands on” management and the highest levels of customer service. This approach is instilled in the group’s staff and management, and is evident through the entire business with non-pushy sales people and attentive helpful service advisors ensuring customers’ needs are met and concerns addressed in the swiftest and most convenient method available. The Group prides itself on its far above average levels of repeat customers and their families purchasing their 4th, 5th, 6th, and 7th and even more vehicles from the business and it is known State wide as “WA’s most trusted car dealer”.